As an iPhone 6s Plus user, I’ve noticed significant improvements to battery life due to the upgraded hardware and the latest iOS update. I certainly can’t complain about battery life, but it’s always nice to squeeze a little extra How to Make Your Phone's Battery Last Longer and Hold More Juice How to Make Your Phone's Battery Last Longer and Hold More Juice Battery life is one of the biggest struggles of modern-day electronics. Smartphones, tablets, and laptops all deal with it -- so what can you do to maximize the amount of time you get per charge? Read More out of one’s device. 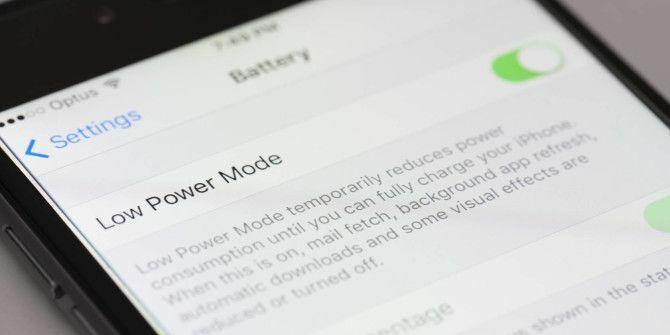 By now, any iOS 9 user should be well aware of the battery-saving feature that automatically prompts you to switch to Low Power Mode when your device drops below 20% battery life. What some people aren’t aware of, however, is that this is a feature that’s always available. You don’t have to wait until your phone drops below the 20% mark to enable it. Just go to Settings > Battery > Low Power Mode and manually enable the feature. It turns off several extraneous features, allowing you to enjoy a ridiculous amount of battery time. Some users report phones lasting for two days or longer! Of course, with every pro comes a con, and if enabling Low Power Mode had no real consequences, then you can be sure that Apple would have enabled it by default. The truth is, it’s not a perfect solution. Enabling this feature alters the user experience by turning off things like animations, visual effects, automatic downloads, background app refresh, and mail fetching. But, if you really need to temporarily squeeze out more battery life, this is how you do it. Or, you could always buy a battery case The Best iPhone 5 Battery Cases Compared The Best iPhone 5 Battery Cases Compared The small, thin iPhone 5 only has so much room, and a small battery almost always leads to modest talk time. Buying a battery case is the easy solution. But which should you buy? There... Read More . Are you running iOS9? If so, on what device? What has your battery experience been like so far? Let us know in the comments below. Explore more about: Battery Life, iOS, iPhone. Nice article, but I have a question about the iPad and the iOS9 updates for it. Do you know if there are any plans to implement that same battery saving feature of it? My iPad used to have awesome battery life, but since installing the iOS9 updates it's been horrible and I'm not using it any differently.